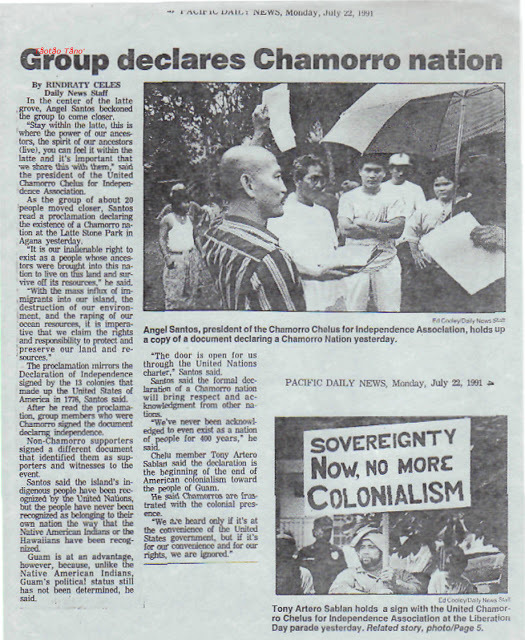 When the p rotest group Nasion Chamoru first emerged decades ago it created a conflict in the minds of people on Guam. On the one hand you had a group of people who were emphatically embodying “Chamorro” things. They were speaking Chamorro, fighting for Chamorro lands and Chamorro rights, and even sometimes sported ancient Chamorro jewelry. But at the same time, for many people, the group seemed to be against everything Chamorros supposedly represented. Chamorros are supposed to be respectful, not speak out and submit to any form of authority. In the way Nasion Chamoru did not shy away from open defiance and critique of the local and Federal governments, they seemed so taimamahlao or tairespetu; without shame or respect. Every culture has their conservative and progressive elements, and an ideological fight always takes place over what is considered to be unacceptable and unacceptable. For some, openly fighting for their rights and for their culture can be considered to be a high ideal, a laudable action. In others, the same actions might be considered shameful and not in line with the spirit of the culture. Your position in this debate depends on what your definition of a Chamorro is. For many people a Chamorro is a very narrowly conceived ideological creature. It exists without what historians call “agency.” As one US Naval Governor put it before World War II, Chamorros are “poor, ignorant, very dirty in their habits, but gentle and [free] from ambition or the desire for change or progress.” This Chamorro is a helplessly passive beast, it always waits to be liberated or for someone else to fix its problems. It is unfailingly hospitable to anyone who visits Guam and lives only to chillax and kick back. This conception of Chamorro culture tells only part of the story. It gives you a view of only part of the history and part of the culture. Gi minagahet, if Chamorros and their culture were limited in this way, the history of this island would be very different. There would be no Chamorro language, the island would be almost entirely military bases and there is a good chance there wouldn’t be an Organic Act either. The progressive aspects of Chamorro culture, symbolized by a willingness to speak out and to challenge the way things are in order to improve them has always been there. It has always sustained Chamorros and encouraged them, even when history seemed determined to destroy them by throwing colonizer after colonizer at them for more than 300 years. For example, protesting has been a significant part of Chamorro culture since 1898, and in every era people have made a stand and spoken out against things they saw unjust or in need of change. In 1901, Chamorros send their first of many prewar petitions to Washington D.C. in an effort to obtain a civilian government for Guam and some basic rights and protections. The first petition had only 32 signatures, later petitions held thousands of signatures, but all were unsuccessful in moving the US government to treat Chamorros with some basic dignity. During this same era Chamorros in small numbers protested the policies of the US Navy over things such as the deportation of Chamorro lepers, the public execution of criminals and even a law that the US Navy passed prohibiting intermarriage on Guam. The most famous of these modern Chamorro protests is the Guam Congress Walkout, which was symbolically helpful in getting the Organic Act passed for Guam. The Guam Congress Walkout made headlines around the US when Chamorros in the Guam Congress walked out of session, refusing to return until the US provided them with some basic rights. This was a time when Chamorros were irritated at the way they were being treated by the US, after they had suffered under the Japanese for remaining loyal to them. As such, in the immediate postwar years Chamorros organized many large and small protests. At least two strikes were organized by Chamorros over the issue of segregated working spaces. A protest was even held over the return of Navy Radioman George Tweed to the island. Tweed hid and evaded capture in Guam by the Japanese for 31 months with the help of Chamorros, but had made some disparaging remarks about the conduct of some Chamorros most importantly Father Jesus Baza Duenas. The protest even featured signs, some of which an angry Tweed knocked to the ground and stomped on. Protest is an integral part of all cultures, and it is a defining aspect over whether a culture can adapt and persist, or whether it will disappear. Tags: Agency, Angel Santos, anghet, Chinamorro, culture, duenas, History, kuttura, Liberation Day, Nasion Chamoru, petition, protests, tweed. Bookmark the permalink.